These noodles are sometimes also called "Khanom Jeen Noodles". Traditionally, these are made from a rice batter made with freshly milled rice flour. There are two types of batter: the fresh and the fermented. The fermented batter is made and let sit until the batter is slightly sour (doesn’t take too long in hot and humid Thailand). These noodles are made at feasts by 4-5 people in a production line. The noodle maker will take a tin can that has tiny holes in the bottom that the batter/dough can pushed through. The noodle maker will hold the can over a boiling pot of boiling water and move it around so that the batter flows out through the holes in a steady stream and turns into noodles when it hits the water. The noodles are then fetched out after a couple minutes and then put in cold water. 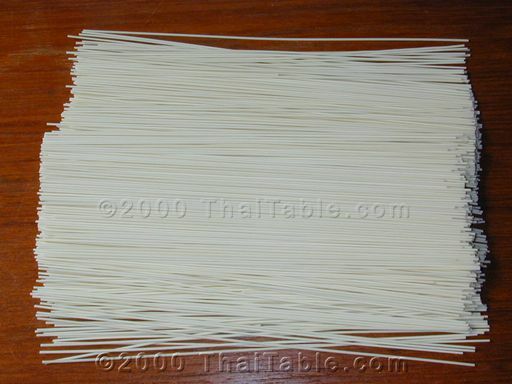 Then the noodle makers will form the noodles into a set of flat nests about 3 inches in diameter. Now, the noodles are made by machines. And the batter is usually fresh as opposed to fermented. I personally like the fermented batter better. The sour flavor makes the noodles more interesting. Outside of Thailand, if you are lucky, there are dried khanom jeen noodles at Asian stores. However, those are hard to come by. I ended up using somen which is Japanese wheat noodles. Somen tastes close to the fresh batter khanom jeen. Somen is available Asian stores. You cook somen in boiling water, the same way that you cook spaghetti.